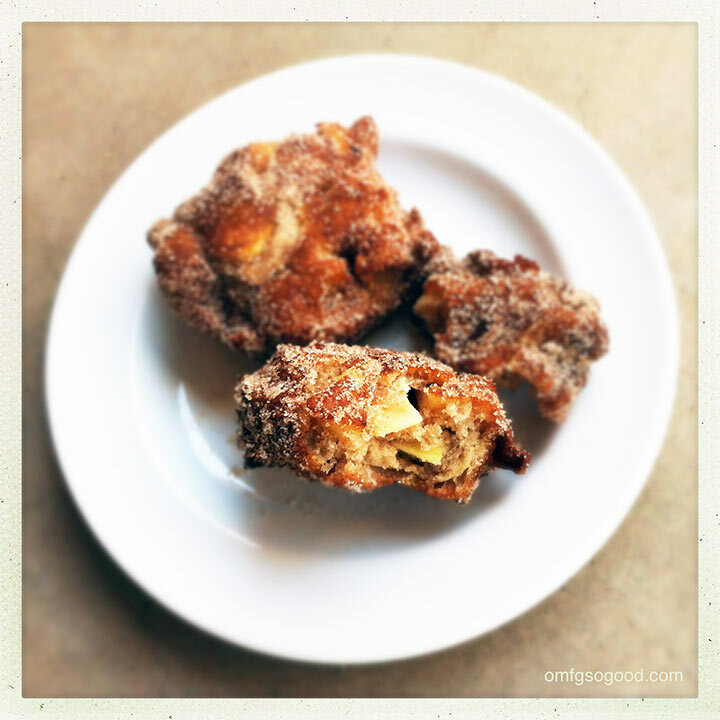 apple fritters | omfg. so good. I would probably eat anything if it was cooked inside of a fritter. Well, maybe not anything. 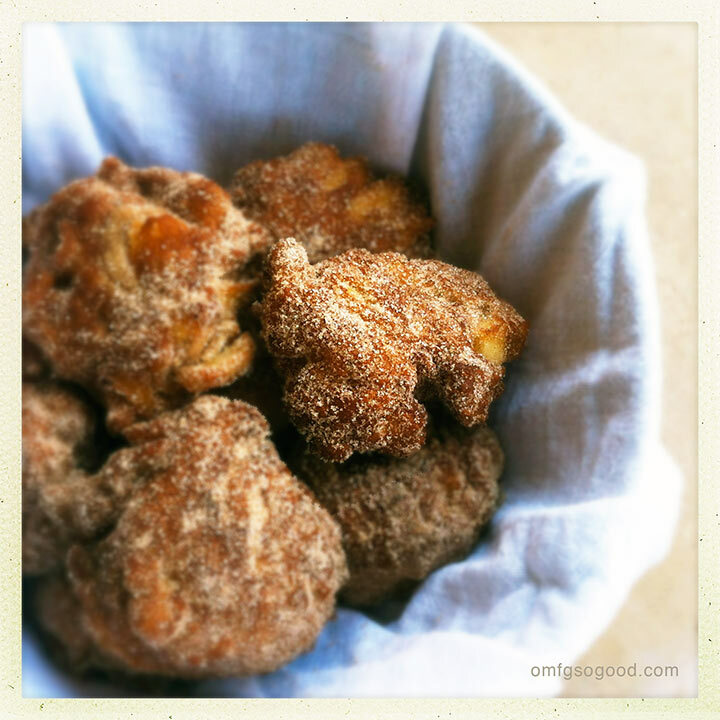 Seriously though, I’m hard pressed to think of many things edible that wouldn’t be just that much better when mixed into sweetened batter, fried to crispy (yet still fluffy) perfection, then tossed in cinnamon sugar. I decided to go with a classic this time for nostalgic reasons. 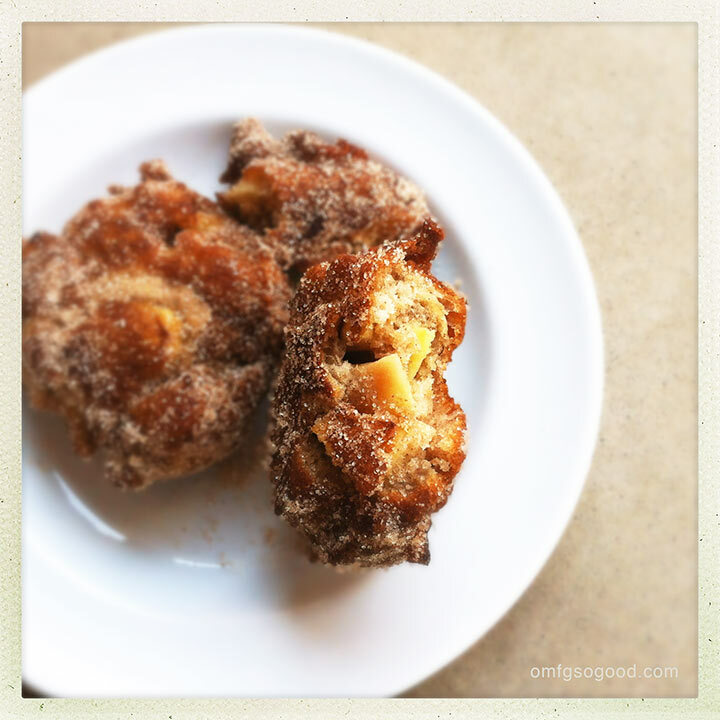 My mom used to make us fresh apple fritters when I was just a wee lass living in an old (possibly haunted) farmhouse in Upstate New York. I remember standing on a chair at the counter, waiting for them to cool just enough to toss them into a sack filled with the perfect blend of cinnamon sugar. Then it was my job to shake the bag. And eat them. What an awesome job. I wish I could get paid to do that now. Let’s make this happen. Preheat the oven to 325 degrees and line a sheet pan with parchment paper, then top with a wire rack. Set this inside the oven so you can transfer the fritters from the hot oil to this ‘warming station’ as you’re working. Peel, core and dice the apples into small, bite-sized pieces. Set aside. In a large bowl, combine the flour, sugar, baking powder, cinnamon and salt. In another bowl, beat the egg then add the milk, vanilla and melted butter. Add the wet ingredients to the dry ingredients and stir with a wooden spoon until just moistened. Fold in the diced apples. Find the one that looks the most inviting, and bite it.